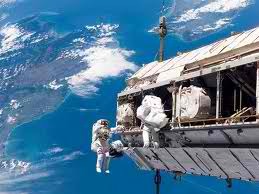 The International Space Station (ISS) is the most expensive construction project ever built. The ISS is composed of joined modules about the size of two football fields which were assembled in space. Sixteen countries from around the world are collaborating on the International Space Station, led by the United States and Russia. These international partners include: United States, Russia, Japan, Brazil, Canada, and European Space Agency—Belgium, Britain, Denmark, France, Germany, Italy, the Netherlands, Norway, Spain, Sweden, and Switzerland. Each country contributes its’ unique expertise—from research labs to construction equipment—to the ISS. When new modules are launched into orbit and docked with the space station, the astronauts and cosmonauts add them to the existing structure in space. 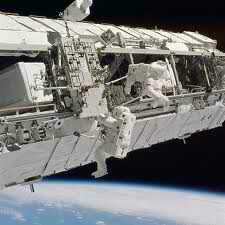 The first full-time crew moved into the space station in 2000. The first piece of the space station, the Zarya—the Russian control module, was launched into orbit in 1998. It was followed the U.S. module, Unity. The Russian modules were launched and docked robotically. Other modules were delivered by the American space shuttle. By 2011, the astronauts added over 150 components during dozens of spacewalks taking more than 1,000 hours of work in space. As of 2011, the station contained 15 pressurized modules and the Integrated Truss Structure. Assembly should be completed by 2012 with the addition of the Russian Multipurpose Laboratory Module Nauka and some external components, including the European Robotic Arm.